Version 0.5.0 brings online-functionality to libsoylent. Want to launch a chat with someone? One function call. Want to see who’s online? One function call. Want to see someone’s online-status? You get it. This release is also the last one for Google Summer of Code 2008. It’s the result of about four months of work. Phew. The plan for the next release is that it will be a pure documentation and bug-fixing release. Also in that version: libsoylent will stop taking control of strings passed to it. This entry was posted in en, libsoylent and tagged GSoC, libsoylent, Planet SoC, Release on August 18, 2008 by Noya. Let me present you the newest version of libsoylent: 0.4.0. Three weeks of hard work went into this release, and in fact so much was added and changed that we decided to skip a version-number. Sorry 0.3.0. So, what’s in it? More or less a complete people-management-library. Our goal was to create a simple yet-powerful API that “just works”. Hopefully we managed that. If you have no clear picture of what libsoylent is or just want to know more about it, look at the examples we’ve put up on the libsoylent-page. Please leave a comment on my blog if you have thoughts, ideas, criticism, feature-requests or suggestions for changing something. Just let us hear your opinion. Anyway, if you’re working on something that needs people-functionality, why not give libsoylent a try? This entry was posted in en, libsoylent and tagged GSoC, libsoylent, Planet SoC, Release on August 12, 2008 by Noya. When will libsoylent be Usable? What happened since the last release? It has been a productive week for libsoylent. Attributes are implemented. That means adding and removing attributes to / from people as well as modifying them works. With that come attribute-handlers. That’s basically a system which provides a way to convert runtime-types to libsoylent-system-types, so you can use arbitrary types like C-structs as attributes (for more information on that see the libsoylent API-draft). Furthermore storing and loading people (and attributes) works. Also the SVN trunk now contains some documentation and a bit of example-code. Some important things are still on the TODO-list: some bugs have found their way into the code and want to be removed soon. Signals are not implemented at the moment, so libsoylent won’t notify you if some person was added or modified or something like-wise. And of course some more documentation and example-code wouldn’t hurt. So, when will libsoylent be usable? The answer is: soon! Perhaps with the next release, coming in one week? This entry was posted in en, libsoylent and tagged GSoC, libsoylent, Planet SoC, usable on July 30, 2008 by Noya. The second release features the basic functionality one would expect from a people-library. Create addressbooks and add some people to it. And then remove them again. People management at its basic level. This entry was posted in en, libsoylent and tagged GSoC, libsoylent, Planet SoC, Release on July 23, 2008 by Noya. The first release of libsoylent is finally there. It contains the most important GObject classes and many function and method stubs and should provide a good ground for the next upcoming features. You can’t do much with it, but you will get a good impression of the whole libsoylent architecture. This entry was posted in en, libsoylent and tagged GSoC, libsoylent, Planet SoC, Release on July 13, 2008 by Noya. Moving to the new flat took longer than expected. But I think the extra time was worth it. The whole flat and my room look pretty nice and comfortable now. Most things are organized, only for the party on friday there is some planing left to do . Internet is still an issue after two weeks of having (almost) no internet-access. Currently we are using the neighbours WLAN until our ISP is done with installing the new connection. The Southside festival was great too. Radiohead and Sigur Ros, yeah! Tegan and Sara were also amazing. Looking back I would say it was one of the best music festivals I’ve been to so far. Nevertheless, being away for two weeks kept me slightly behind my schedule. Version 0.1 is ready but not released, because of organizational reasons. In the meantime I’m already working on v0.2. Last week I finished the foundation of libsoylent. That basically means I thought in greater detail of the architecture (see below), designed the needed GObject classes and made stubs for most functions and methods. From now on there should be a release every week, and a solid foundation will help a lot. The libsoylent architecture as shown in the diagram: SlBook is the addressbook where people (SlPerson) and groups (SlGroup) are stored. People and Groups are entities (i.e. objects with attributes that can be modified etc.). SlEntities are backed by SlEntityHandlers. For SlPerson there will be an EDS-handler and for SlGroup a file-handler. More handlers can easily be added (if needed). The storage of attributes (SlAttribute) is managed by attribute-handlers (SlAttributeHandler). They are responsible to convert runtime-values to values that can be stored by the entity-handlers (e.g. a SlAddress C-struct to a VCard-string for EDS). If you have any thoughts on the architecture I’d be glad to hear them. This week I will have more time and work on people, group and addressbook management. And of course on the first release . This entry was posted in en, libsoylent and tagged architecture, flat, GSoC, libsoylent, Planet SoC, Southside, stubs on July 8, 2008 by Noya. Finally the libsoylent API draft is available. After another week of discussion, I think it covers most of the functionallity the API should provide and also some interesting background information and implementation detail. I’m really looking forward to comments, ideas, suggestions for improvement and also criticism . Last week, besides enhancing the libsoylent API draft, I also focused on two other things: creating a detailed schedule for the rest of GSoC and getting my hands dirty with coding. Some implemented things already work: creating addressbooks and also listing all available addressbooks. I mostly found out how to do this with libebook by digging through the Evolution source; really a huge codebase. Furthermore I refactored the little libsoylent test “suite” to better work with make check and added some tests for SlBook. For the schedule I wrote down the tasks that have to be done for libsoylent, developed a roadmap including milestones and releases and planed when what functionally should be implemented. The schedule is available here. The next one or two weeks I will be very busy (as you can see in my schedule). Tomorrow I’m going to the Southside music festival for 4 days, and after that I will move to my new flat share, what will probably take about a week. Luckily I started early with GSoC and will have much time after the current university term is over . This entry was posted in en, libsoylent and tagged API, flat, GSoC, libsoylent, Planet SoC, schedule, Southside on June 18, 2008 by Noya. Last week I put all my effort in the libsoylent API. I started thinking about the API design weeks ago, but now I gathered all my notes and assembled them into one big document, made some diagrams and worked out the API in more detail. The person and the addressbook objects are mostly done, while groups still need a bit of work. All in all it seems like a good base to get started. Currently me and my mentor are discussing the whole draft, and I will publish the API as soon as we are done. After I had a feeling that the API looked solid enough, I started to get my hands on the “base-code” of libsoylent, i.e. adding the main classes and GObject stuff and making everything compile and work with stubs. I also added a simple “test-suite” that can easily be extended to test certain functionality of libsoylent. This week we also received a patch from Gilles Dartiguelongue that fixed some issues with the autotools configuration of Soylent / libsoylent. That was the first patch for me to apply (yeah ^^). In the end something off-topic. After weeks and months of searching for a new flat (it’s not easy in Erlangen, I can tell…) for me, my girlfriend and a good friend of mine, we finally found a new home. Today we signed the lease contract. So, in three weeks I will post from a new flat. Nice! This entry was posted in en, libsoylent and tagged API, flat, GSoC, libsoylent, Planet SoC, SVN on June 11, 2008 by Noya. As this is my first post on Planet Gnome (and also Planet SoC by the way) I’d like to take the chance to introduce myself: I’m Sven Pfaller, a 21-year-old computer science student from Erlangen (near Nürnberg), Germany. In the scope of this years’ Google Summer of Code I work on Soylent, more precisely on libsoylent, a library that will try to integrate people deeper into the (Gnome) desktop. If you want to know more about the project, you can have a look at a previous blog post I have written some time ago. So, hello everyone, nice to be here . Much stuff, isn’t it? The sample programs I wrote include a simple GTK+ GUI, a GObject based mini-game, D-Bus and libebook utilities, and ChabChab, a command-line instant messanger. I am amazed of the capabilities of the Telepathy / Mission Control / Empathy trio, as I was able to write a solid IM in almost no time. With all the things listed above I felt well prepared. After adjusting the SVN repository’s autotools to include libsoylent (outch, pain!) and carefully going through the complete existing Soylent code, I started to write down my thoughts about the libsoylent API. Presumably a first public draft will be available by the end of this week. There’s still much to do and I am slightly behind my schedule, so I better get going . 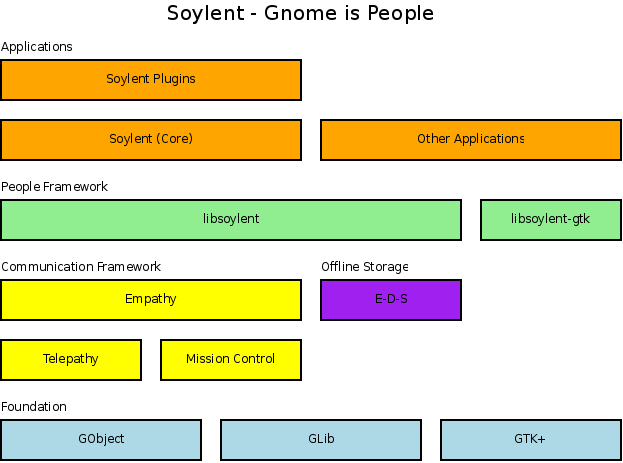 This entry was posted in en, libsoylent and tagged Documentation, Gnome, GSoC, libsoylent, Planet SoC, Tutorials on June 2, 2008 by Noya.